Can Cabei est une maison typique d'Ibiza avec ses murs blancs et ses plafonds en bois construits au XVIIe siècle. Situé à moins de 500m de la plage Playa d'en Bossa et à 5 minutes en voiture du port d'Ibiza ou de l'aéroport. Proche des commodités et des excursions régulières en bateau vers le port depuis l'embarcadère situé à seulement 500 mètres. 1500m2 de jardin avec piscine. Entièrement équipée avec TV Sat, WiFi, Salut Fi, 2 ambiantes salons, grande salle à manger. Cuisine et buanderie. Deux salles de bains avec grande douche. Une salle de bains sur la chambre principale. Notes sur l'hébergement: Check IN: à partir de 16h Check Out: avant 10h Accès Internet. Chauffage central. Climatisé. Dehors: 1500m2 de jardin, terrasse et piscine privée. Buanderie: Buanderie entièrement équipée. Service de nettoyage / serviettes / / Femme de ménage: Locations comprennent les draps et serviettes. Changements et nettoyage hebdomadaire. Autre: Grande terrasse autour de la piscine et véranda avec une table à manger et un salon en plein air. Idéal pour le coucher du soleil se détendre. We loved our stay at the villa. Pablo was very responsive & helpful from when we booked to when we left. The pool and outside areas are great & there are plenty of sunbeds and seating to relax. Everywhere was lovely & clean. Kitchen was well equipped however, a small welcome pack would have been greatly received when arriving very hot and thirsty. Even just a couple of bottles of water in the fridge would be nice. Perfect location. Short walk to shops, restaurants, bars but we also hired cars to get around the island. A group of 3 couples in our 40's. Villa outside space is great! lovely well kept and colourful scrubs / trees. 6 comfy sun loungers, big outside dining table, plus outside seating area. Inside has all the facilities you would expect. Wireless is ok for browsing, but not for streaming content. The TV in the lounge is in Spanish (for Fifa football we watched the muted TV, but streamed audio from UK via our speaker) Had some issues with electrics tripping, but Pedro fixed this quickly when I informed him. Pool was cleaned once during the week, no other cleaners provided during the stay, but we cleaned the towels in washing machine & Villa is easy to keep clean yourself. Enjoyed our stay and we would recommended. Beautiful property, full of character and great location. Lovely Villa, very homely, with lots of character in a quiet residential area, although only 5 mins walk to beach and shops. 10- 15mins walk to the busier part of Playa Den Bossa. Very clean and well equipped. We particularly enjoyed the outside area and pool. We would definitely return and highly recommend the boat trip to Formentera. 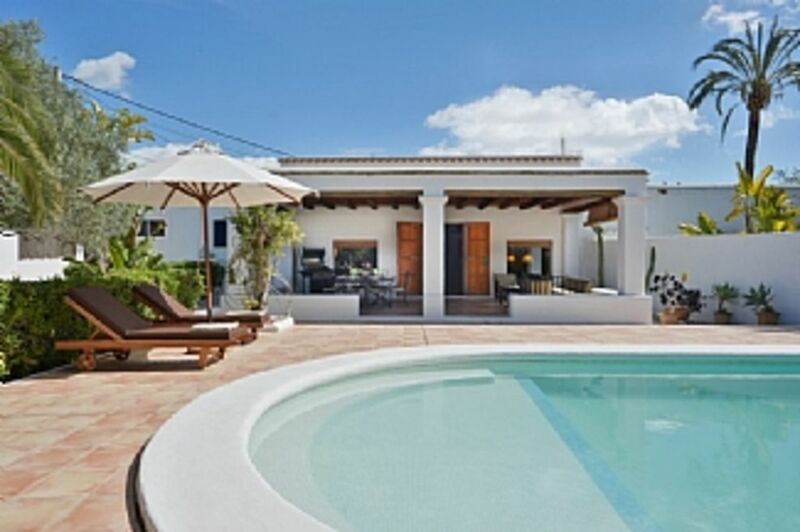 The villa with pool was extremely well decorated and equipped with a nice touch of Ibizan style. Kitchen & bathrooms nice and all worked well. We were welcomed by the local staff at a time that suited us well. We also liked the welcome drink with fresh fruit. Contact with the owners was nice and to the point. The villa is located in an area of Eivissa that is a bit under construction but will be into shape not long from now. The nice part of the area is that it is a quiet part of Eivissa with restaurants and groceries at walking distance. Also Eivissa harbour and centre area and the great Eivissa clubs are close by but a rental car makes it more convenient. From our experience we can recommend Centauro car rentals wich is also in a 10 km range of the airport and the villa. To summarize, we had a outstanding week to discover Ibiza. Stayed here in Sept with a group of friends, the Villa was lovely, clean, well maintained with a great pool. Well stocked with everything we needed (towels, kitchen equipment, internet access etc) and in a really handy location. 5 minute walk from, Playa Den Bossa Beach, where you can take boat trips to Formentera or grab a water taxi across to Ibiza Town. 5 mins will also take you to the shops,off licences, bars or taxi ranks. Pablo, the owner was easy to get in touch with and was kind enough to let us drop our luggage off early before checking time. Really enjoyed our stay here and would definitelyou stay here again. 300m de la plage de Playa d'en Bossa. 5 minutes du port d'Ibiza et de toutes commodités. À distance de marche des commerces, restaurant et plage. Booking Notes: 50% required for confirming the reservation. CHECK IN-OUT: SATURDAY Changeover Day: Saturday Notes on prices: Special early booking discounts or long stay rentals discounts. 500€ Refundable Deposit required at check in (returned at the check out) PLEASE CONFIRM by phone with the owner before transfering payments.